As as Licensed Dealer through the Texas Parks and Wildlife Department. Alvin Marine offers used Boat / Motor Consignment Sales. You set the Sales Price and we deal directly with your potential Buyer. Using our onsite back in pond your Buyer will have the ability to see the Boat / Motor run prior to purchase. Alvin Marine also takes the guess work out of the Title Transfer process by handling all Title paperwork in requirement with the Texas Parks and Wildlife Department. Our location has great visibility and high traffic for potential Buyers to see your Boat / Motor. Alvin Marine not only offers a full service repair shop with factory trained and certified marine technicians, we also offer a wide array or Parts and Accessories. We have thousands of parts in stock at our location for the "DIY" Customer, if an item is not in stock it can be ordered and delivered to our location within 5 business days* Our inventory includes Yamaha, OMC, Johnson / Evinrude, Mercury, Quicksilver, Honda, Suzuki, Tohatsu, Seachoice, Moeller, Arco, CDI Electronics, Continental Batteries and many more. All major brands of Credit Cards accepted in addition to Cash and Checks. In addition to New parts, Alvin Marine also offers a variety of good used parts. 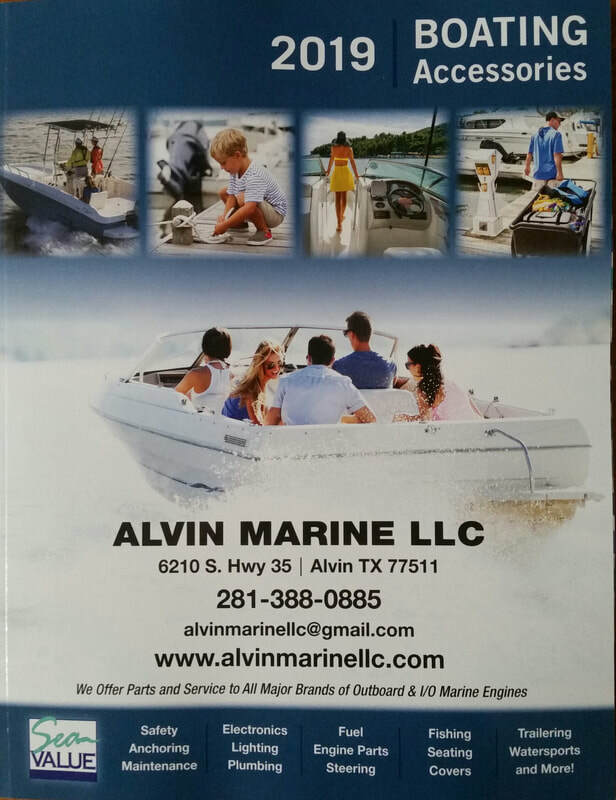 From hundreds of propellers and lower units / gear cases to internal engine parts and electronics, Alvin Marine may just have what you are looking for to complete your repair. Being in business since 1995 we have accumulated quite the inventory of used parts. Including but not limited to; Steering systems, Steering Cables, Control Cables, Jack Plates, Gauges, Electronics, Engine Cowlings, Empty Gear Cases, complete Lower Units, Shift Rods, Propellers, Propeller Shafts, Control Boxes and much more.